Fire. The topic is very open for this challenge since Dave is away and I have no idea what's happened to him I though we would have a bit of a unique TC. Credit goes To Jake Kobrin For suggesting the topic. Fire can be whatever you want it to be, a character, a creature, an environment, a power etc etc. Try to think outside of the box and push yourself to create something finished. Your getting a day extra because this is supposed to be started on monday. Good Luck everyone and Hope you have fun! Last edited by Nibras; March 7th, 2010 at 07:03 AM. Woooo! Go damn you! really cool to see stuff coming in. Last edited by ryan mcshane; March 7th, 2010 at 07:43 AM. This sounds like lots of fun. I started a rough sketch. I want to incorporate a fire breathing dragon fighting some warrior in a volcanic zone. It'll be interesting to render this because I've never fully rendered an environment before, but I'll try. The hardest part will be to avoid making it look cartoony. Last edited by RickyS; May 14th, 2011 at 07:32 PM. Prespective is looking so tastey on that piece! Lilnebo: Awesome work in getting something started, I was afraid we were gonna be dead for a while. Also smart topic, allowing freedom but keeping a cohesive theme! You can definately add your art to the mix! There is no rules against it! Ike Ike: Awesome Character design coming along there! Be careful with your pose though, top half looks like he's standing while his legs are full of motion. If you want to make him running I recommend "googling" runner's, Olympic track runners, or joggers... I think it will help the piece over all. Ryanoir: now that you have the sketch down. I can't wait to see who this character is, where he lives, and what's his role in his society! Ricky S: Nice sense of depth. Can't wait to see the forms more "fleshed" out. if you don't want to go cartoony then just stay away from outlines and you should be fine. Think of how the light plays with the forms for example, where is the main light source? What surfaces reflect or absorb light? and remember atmospheric perspective! I look forward to seeing your final! Still one more week! I plan on making sketches for this tonight when I get back from School. here's my quick sketch of a generic fire hero...I think conceptually I want to go back to the drawing board. But I still wanted to show my WIP. ike_ike: Looking really nice, love the use of the blue background to add contrast. The eye lloves contrast so the more the better Like jatari said the pose makes him looking like he's falling but he's a fire dude so he can have all sorts of power! Last edited by David.W; March 8th, 2010 at 04:42 PM. David W. nice concept, it will definitely have a good story! I definately want to see more of the environment the lion is in. right now I'm left wondering if the lion is performing, or learning to perform this new trick, and what's the lion's motivation?! 6 more days to work it out! Can't wait to see more! 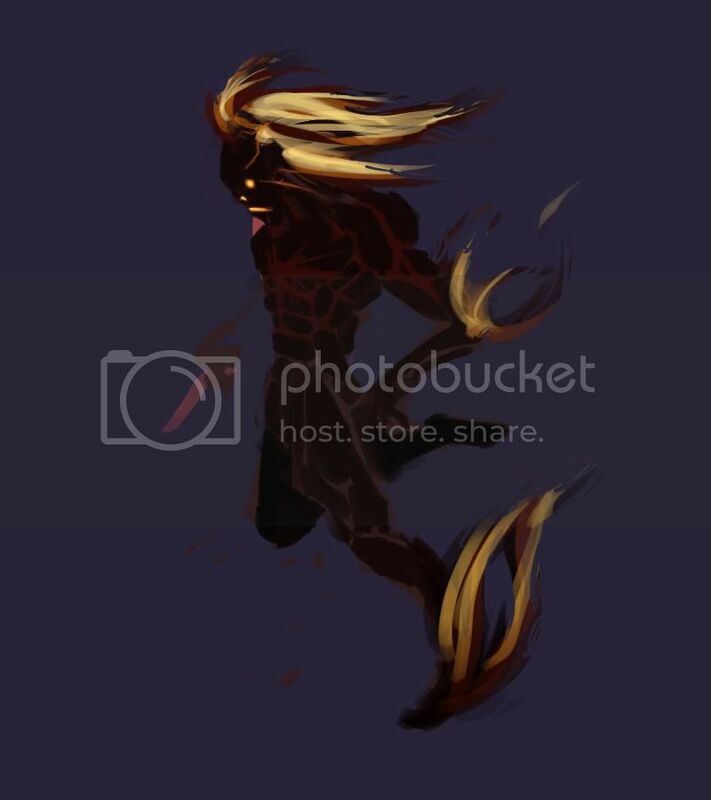 I decided to work some more with the generic fire hero, and see what kind of narrative I can create to make him unique...I've worked on the fireball which bothered me the most, and increased the amount of contrast on the shirt, and body. Including digital matte painting techniques through textures and the like. btw, excuse my, let's say, not perfect english, just in case you find any mistakes! @ ike ike - That's a sweet character so far! I like how the facial features stand out from the face. The others have already pointed out the problem with the pose, so work on that and it'll be awesome! @ r y a n o i r - Nice sketch! There are some anatomy issues (like the right leg is a little short), but keep pushing it! @ Jatari - Thanks a lot for the tips! I've got a light source and I removed the lines like you suggested, but atmospheric perspective is hard! By the way, your entry is freakin' AMAZING! Especially the fire and the lighting effect. The quick sketch itself looks finished to me. @ lilnebo - Thank you, glad you like it so far! Hopefully I won't ruin the final render and disappoint you with my inexperience. @ David.W - That is a sweet idea and sketch of a lion! I don't know if you'd consider this because you already put a lot of work into your WIP, but it would probably be cooler if you used more dynamic perspective (like viewing the ring more from the side rather than straight on). The lion is also in a static pose, so it would be better if you added more anticipation, like have the lion bend it's legs as if it was preparing to jump through the ring. Anyways, it's up to you, so good luck! Here's a little update on my entry. I've been working on rendering the environment since it'll be the hardest part. I think it's okay so far, but other people have said I need to push the contrast on my paintings more and I'm confused. I'm not sure what they mean because I have lights (almost white) and darks (almost black). I've also tried following the rules of atmospheric perspective and have the foreground elements darker and clearer and background elements lighter and misty. Am I missing something? I hope I didn't ruin the esscene of the original sketch. If someone could clear up the contrast thing, that would be awesome! I also plan to model the dragon after frill-necked lizards, so that'll be cool. David: Very very smart idea, totally loving this concept so far. The lion is very well drawn, it's all too cool Just waiting to see where it'll go! @ lilnebo - Yeah, I'm really trying to push this as far as I can to see what areas I have to work on the most and so I can make my first finished digital art. Thanks. Today I designed the warrior/knight because the stick man is silly. I started with some basic sketches, then I drew him in the stick man's pose. Unfortunately the knight isn't as expressive as the stickman, but at least I got a good design, so it's okay I guess. The next step is probably to do the dragon design, then I'll spend the rest of the time rendering and adding stuff like fire, lava, mist and volcanic rocks. RickyS: Hey wanted to give you some congratulations for all your hard work so far...trust me your first completed work is the hardest! The sky looks better darkened. Also your volcano is odd. I know movies have portrayed large basaltic volcanoes with flowing lava and huge billowing clouds of smoke and explosions, but in reality it's either one or the latter. For the volcano's in your work that billow smoke & ash, search for basaltic volcano's like mt. saint helens. I'd consider shading the sand in the foreground darker than the background to help create that depth. I'm excited to see how your dragon looks keep it up! here's my current wip. i didn't have much time yet but i'll work on it later. 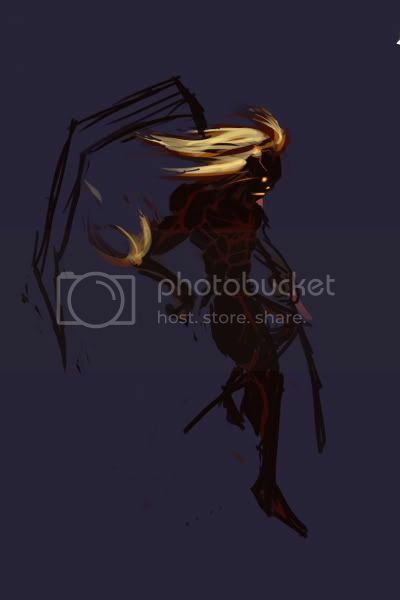 David W.: Based on how dark the background is there is going to be a couple cool lighting effects you can do depending on the main light source. 2 and 3 I think could also work interestingly together. The eye's of the lion make it look nervous, I would play this up it's an interesting narrative! Good luck with continuing to finish! still a few more days left! @ Jatari - Thanks again! I will research those volcanoes when I get to doing that part of the painting. Interesting information. Sorry! I said I would have the dragon design done by yesterday, but it was harder to design the dragon than I thought. I just don't know enough about animal anatomy and this is actually my first fantasy creature. In the end I had to settle for a less than satisfactory design because the deadline is soon and I still need to render a lot (which will take lots of time). Oh well, at least I know that after this I will have to study a lot of things to improve. Good luck to everyone else. The latest entries are looking awesome! Phew! This is my final, hope you like it I'm looking forward to seeing yours! Last edited by David.W; March 13th, 2010 at 02:08 PM. Here's mine so far. If someone has any critisism or anything (composision, perspective etc. )I'd love to hear it before I finish it. ..Can't wait to see everyone's finished work. if it's just a creature you made up - well, thumbs up! i really like the composition and colors! @ David.W - That's an awesome final! There are a few messy spots you could clean up, but I like how the fire illuminates the lions face. Good job! @ zelda geek - Your WIP is cool. I think the composition is great how the trees fall down and circle the monster/animal. I also like how you made the forest look like it has depth. Sorry this might be too late since the due date is soon, but I think you could work on the figure in the foreground. The way you have it right now he looks really static and it seems as if he isn't reacting to the monster in front of him. If someone saw something like that in front of them in real life, they would be scared and would react (in fear, defense, offense, whatever), which should be shown in their body language. They wouldn't be standing up straight. Anyway this is just a small thing you should pay attention to in the future, but otherwise the drawing is awesome and I love the creature! Yay! I finally finished my entry! I'm glad I was able to finish it on time. Even though it isn't as good as I wanted it to be, at least I reached a goal and learned a ton of stuff. Thanks for the challenge lilnebo, it was fun and rewarding. I wouldn't have been able to make it this far without help from some people too, thanks. Sorry Jatari, I ended up removing the volcanoes from the final because the lava was conflicting with the fire, but thanks for all the help. If you haven't already I recommend going into photoshop and change it to black and white to see how contrast, and shape are working in your piece. Just looking at some forest fires, I think if you added some darks to the foreground and/or add something to enhance the illusion of depth like burning logs between the tiger/bear and the fireman. right now that area is looking a flat and overlapping would be a good way, in this case, to add depth. David W.: Your final is pretty cool, minimalistic but its strength comes from the expression on the lion which you have hilighted with the ring of fire. You make me want to put the fire out or pull the lion away and tell him he doesn't have to jump if he doesn't want to. and the fire is looking darker than the lion itself. You should look up Spanish Baroque Paintings and Caravaggio for inspiration with their use of Chiaroscuro. RickyS: Hey nice final! You really pushed it from the last WIP! AWESOME! I didn't mind that there wasn't any lava showing, the darkened sky gives it a feeling of smoke, and carbon being pumped into the atmosphere. I definately like the ground darker, this helps give it contrast and a successful atmospheric effect. The fire is really stylized but so is everything else, so stylistically it works thanks to your consistency. The only thing that's bugging me is how little the contrast is on the knight, especially with that very large and very bright lightsource directly on him. What do you think Linenebo and gang? Underneath is my final as of today...alot of family issues and a mid term prevented further development of my submission. so i basically forgot and gave up on this so sorry! nice entries guys good luck!